Custom engagement rings are becoming more and common these days. Custom diamond rings were once reserved only for the wealthy, but this has changed. We’ve spent the last 30+ years collecting the best diamond rings and estate jewelry in Orange County. We’ve also made some great connections in. Our passion for the finest and most unique jewelry has attracted some very talented people in the industry from all over world. Our jeweler has been with us for decades and is the go-to guy for custom engagement rings in Orange County. He is also the jeweler that other Orange County engagement ring stores consult with when faced with a difficult job. Watch & Wares has provided expert jewelry repair in Orange County for the last 30 years. Because of our attention to detail and respect for the craft, we’re able to restore & repair diamond rings and all jewelry to their original state & luster. Watch & Wares is also known as the place to go when looking for custom engagement rings. Some people are looking to save money by providing your own diamond or precious gemstone. Others want a custom ring and/or setting built around a treasured heirloom diamond or gemstone. There are hundreds of options when it comes to creating custom engagement rings. We pride ourselves on listening to your needs, then providing expert guidance. We understand that you engagement is a one of the most important days you will ever experience. Tastes and budgets differ and we get that. From affordable engagement rings to high-end luxury, we’ve got you covered. When creating a custom diamond engagement ring, the options are endless. We are able to create custom engagement rings from scratch or recreate a diamond ring from a photograph. We’ve done this for many customers who’ve lost a treasured heirloom or fell in love with a piece they saw in a magazine. Our selection of customization options are virtually endless, however we are happy to offer help when needed. 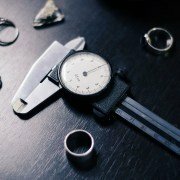 If you’re working within a particular budget or need step-by-step help, we’re you’re engagement ring store! 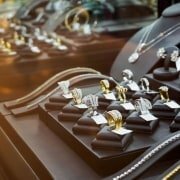 Furthermore, if you’re looking for a trustworthy jewelry store in Orange County that has an impeccable reputation, look no further! Click here for more information on shopping for antique or vintage engagement rings in OC. If you’re thinking about popping the question, we’d love to hear from you! We’ve been a part of countless special days and have customers that buy from us from all over the world. Our flagship Engagement Ring Store located in the Orange Circle has been serving Orange County & Surrounding Areas for over 30 years. We hold a 5-Star Rating on Yelp and our eBay Store, where we’ve sold since the early 90’s has 100% Feedback. Send Us a Message Using our Contact Form! 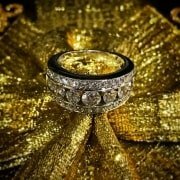 *Watch & Wares also buys custom engagement rings, diamond rings, wedding bands and estate jewelry in Orange County!